1. LAVINIA BENEDETTI Killing Di Gong: Rethinking Van Gulik's Translation Of Late Qing Dynasty Novel Wu Zetian Si Da Qi'an. 2. HE YANRAN Sage Descendants Fight: A History of the Master You Ancestral Hall in Chongming. 3. KHEE HEONG KOH Claiming Authority in Lineage Leadership - A Fujian Case Study. 4. 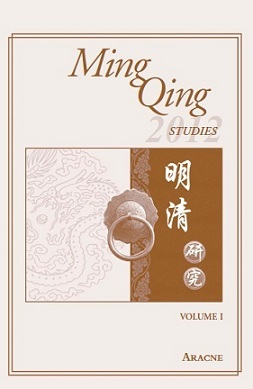 LEE CHEUK YIN The Child-heart Mind: Li Zhi (1527-1602) and Intellectual Changes in Late Ming China. 5. LIU FEIYING Powerful Bonds: Male Homosocial Desire in Pu Songling's Liaozhai Zhiyi. 6. OLIVIA MILBURN Strange Stories of Judge Shi: Imagining a Manchu Investigator in Early Imperial China. 7. FRANCESCO PARODI The Taiping Rebellion in the Letters of the Catholic Fathers in China. 8. WANG BING Poetry Anthologies' Strategy for Constructing of Literary History: A Focus on Contemporary Anthologies of the Early Qing. 9. WANG YIZHOU The Origin, Transformation and Representation of the Double Lotus. 10. YUAN XING Leaving the 'Boudoir' for the Outside World: Travel and Travel Writings by Women from the Late Ming to the Late Qing Periods.